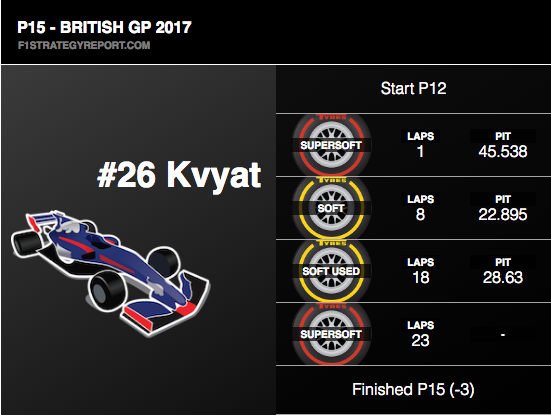 British GP F1 Strategy Report Podcast – our host Michael Lamonato is joined by Zach Priest from Superlicense F1 Podcast. 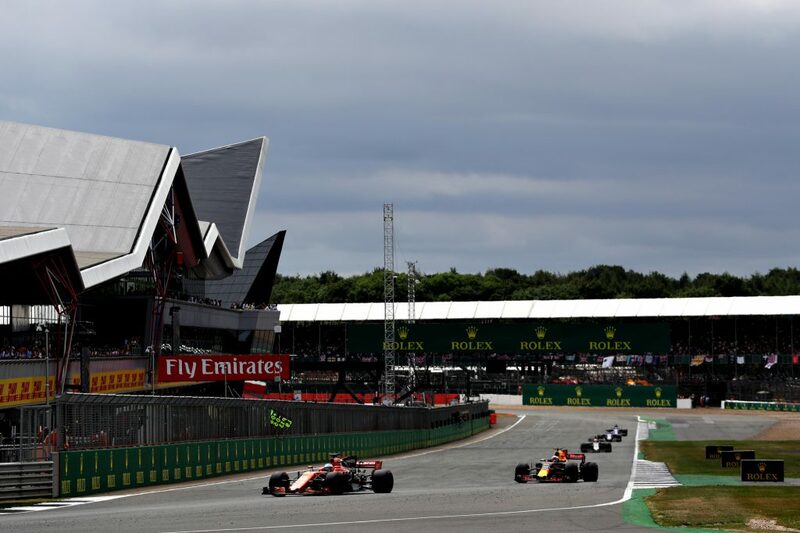 Mercedes driver and three-time F1 champion Lewis Hamilton was an unstoppable force at his home race, taking a dominant and record-equalling British Grand Prix victory at Silverstone. He led every single lap in what was a lights to flag victory, but while there wasn’t much action at the very front of the field, there were plenty of entertaining battles and storylines further back – with the podium positions only decided on the last lap. 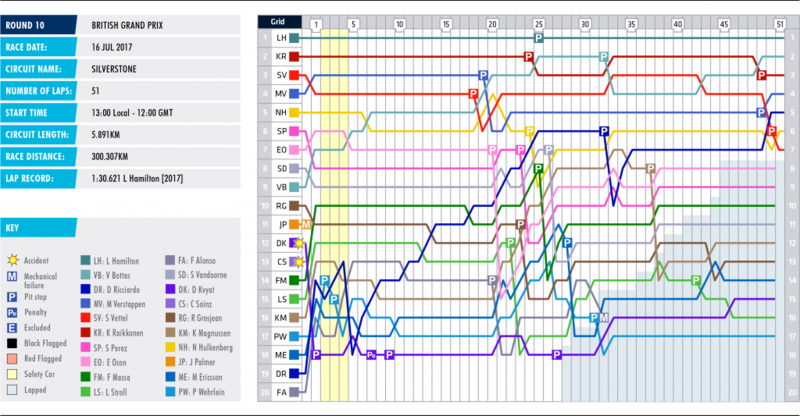 Late drama due to tyre problems prevented Kimi Raikkonen of a strong second place, with Valtteri Bottas benefitting to finish runner-up and give Mercedes a 1-2 finish. Raikkonen finished third, though, with Sebastian Vettel picking up a puncture just one lap after his team-mate. 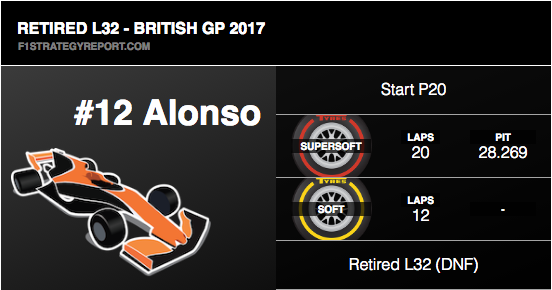 In typically Silverstone style, rain played its part during the British GP weekend, but it didn’t arrive for the race. Light showers disrupted the early stages of FP3 and impacted the first segment of qualifying, but the circuit eventually dried out and the sun started to emerge from behind the clouds. 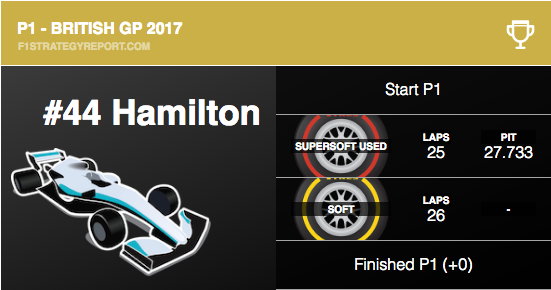 As we’ve seen before, drivers largely stuck to just two of the three dry tyre compounds during the weekend – the soft and super-soft, which both proved to be durable and had similar performance levels (around seven tenths between them). Pirelli has been very cautious with its 2017 compounds and it’s prevented drivers from using alternative strategies, with most being one-stop races. It was the same story at Silverstone, although there was a bit more of an opening for a two-stop, but this would likely leave drivers in traffic. 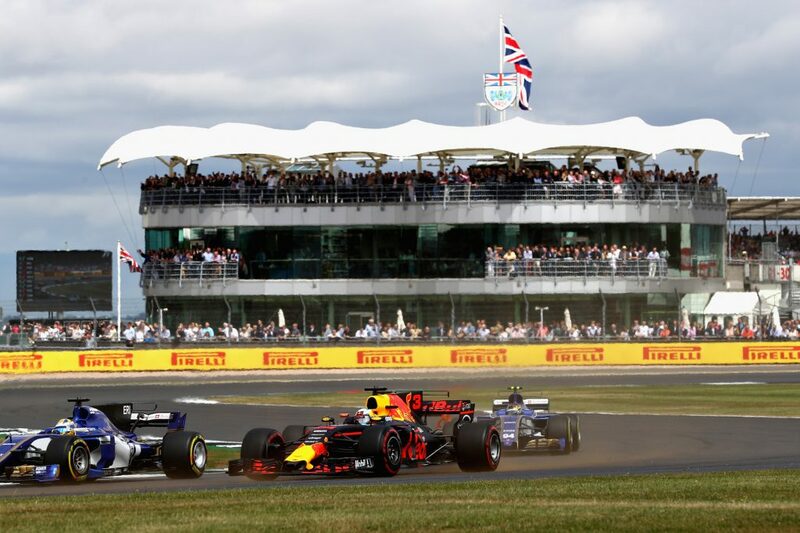 Ferrari racer and championship leader Vettel pretty much lose his chance of F1 victory at Silverstone in the first few corners, when Max Verstappen got ahead of him and into third. The Red Bull was lapping around one second slower than Hamilton and this dropped Vettel out of contention by the first stops. 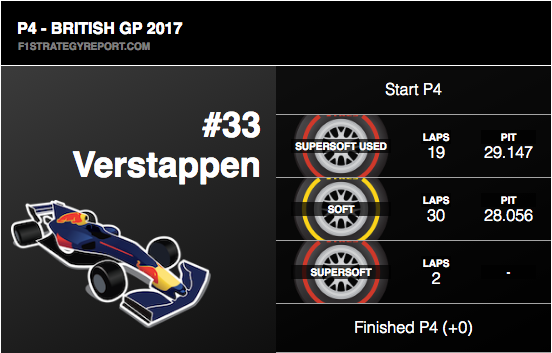 However, he did move ahead of Verstappen with an early pitstop on lap 19, ditching super-softs for softs. It was a perfectly-executed undercut, with a brilliant outlap and a slightly faster stop. 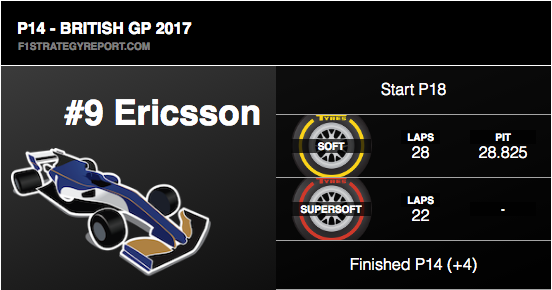 This enabled him to pull ahead of Verstappen, but he didn’t have the pace to hold off a charging Bottas. Pirelli has said that the tyre woes suffered by Ferrari on lap 49 and 50, for Raikkonen and Vettel respectively, are different. The Italian tyre manufacturer is now evaluating what happened. 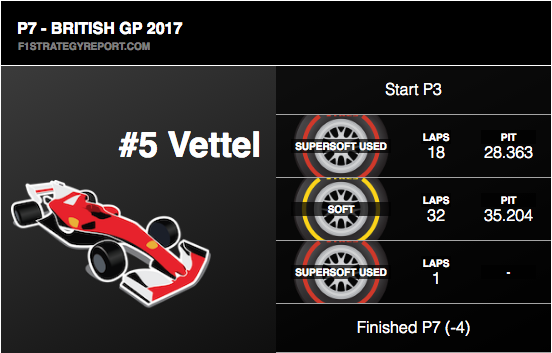 What’s clear, though, is that Vettel’s was a puncture as his tyre was completely destroyed, while Raikkonen’s still kept its shape. The late drama cost Vettel the most, as he slipped to seventh, while Raikkonen’s tyre let go later around the lap and was still inflated so he made it back to the pits at a quicker pace. This was crucial in keeping him P3. For the second race in a row, Mercedes knew one of its drivers had a grid penalty before qualifying and did something different to set up an attacking race strategy. Bottas set his best Q2 time on softs, which meant he started on the middle tyre compound for a long opening stint before pitting on lap 32. 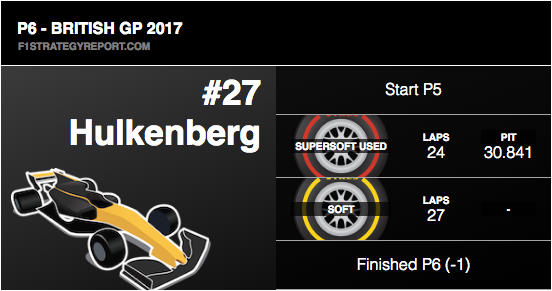 By that stage, he had already made up a few spots after a good first lap, but having the supersoft tyres at the end of the race allowed him to charge up the order and enjoy some brilliant battles. 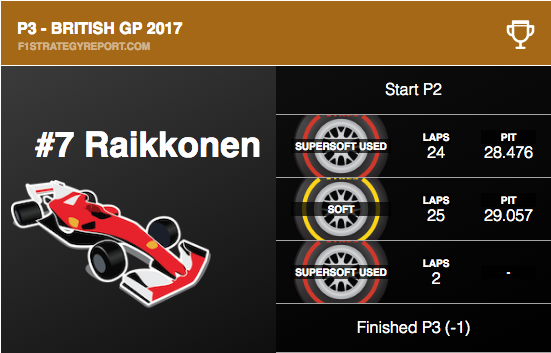 Verstappen holding Vettel up early on helped, as did Raikkonen’s issue, but it was nevertheless a strong performance – to go from ninth to second. 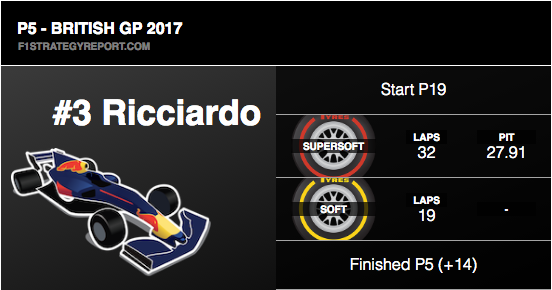 Daniel Ricciardo lined up 19th on the grid after penalties and a mechanical issue in qualifying. 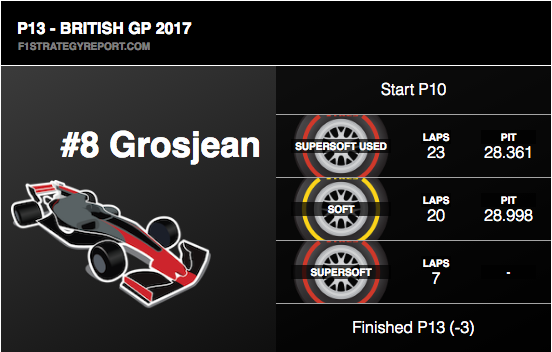 With more tyres available, he used fresh super-softs for his long first stint, looking after the tyres well – while also battling his way past slower cars. 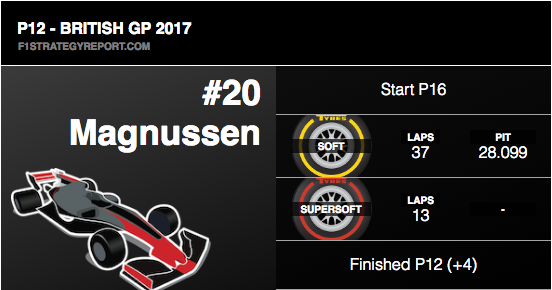 He had a few knock-backs, after being forced wide early on and dropping back to last, and also losing three spots in the pitstop. The Aussie made those back up though in less than two laps. 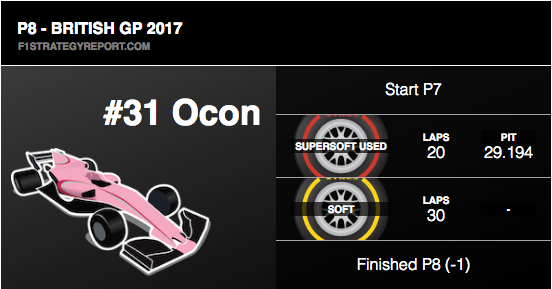 He was aggressive when he needed to be, but it was also a classic drive of tyre preservation too, keeping his super-softs in good shape and giving him fresher softs for a final fight to the flag. Stoffel Vandoorne enjoyed his best weekend of the season so far, making it through to Q3 and almost scoring a point. 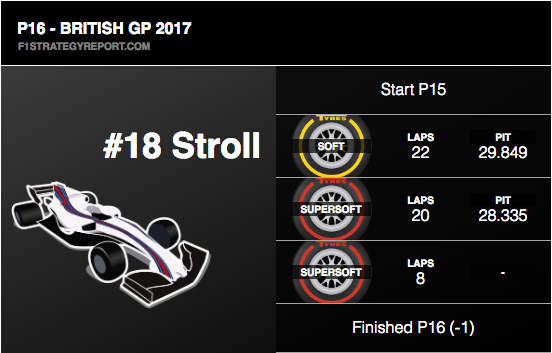 It all unravelled with a slow pitstop on lap 26, allowing Felipe Massa to undercut him – helped by the Brazilian going from softs to super-softs. Vandoorne kept with Massa though and came close to finishing P10, but it wasn’t meant to be this time. The early safety car period on lap two opened up the opportunity to take a risk and Sauber did just that with Pascal Wehrlein. 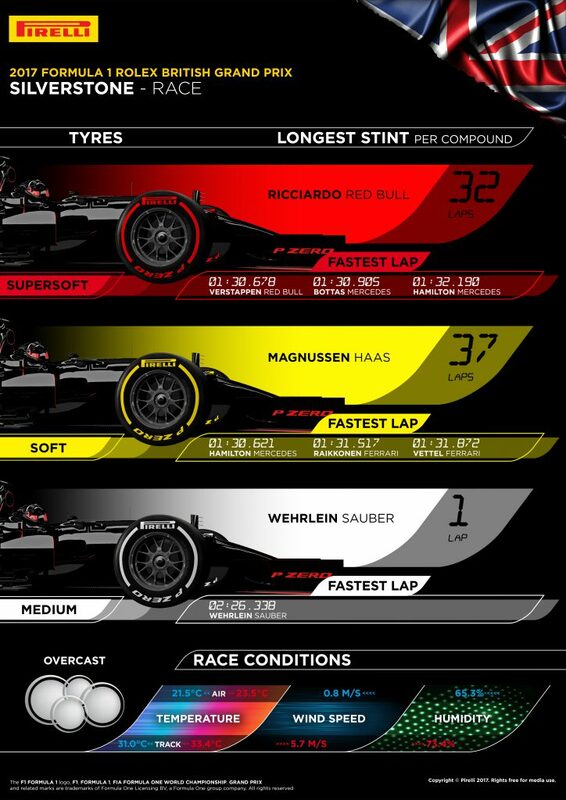 He pitted to go from softs to the unflavoured mediums, the only time the compound was used in the race, before then stopping again to go back onto fresh softs. 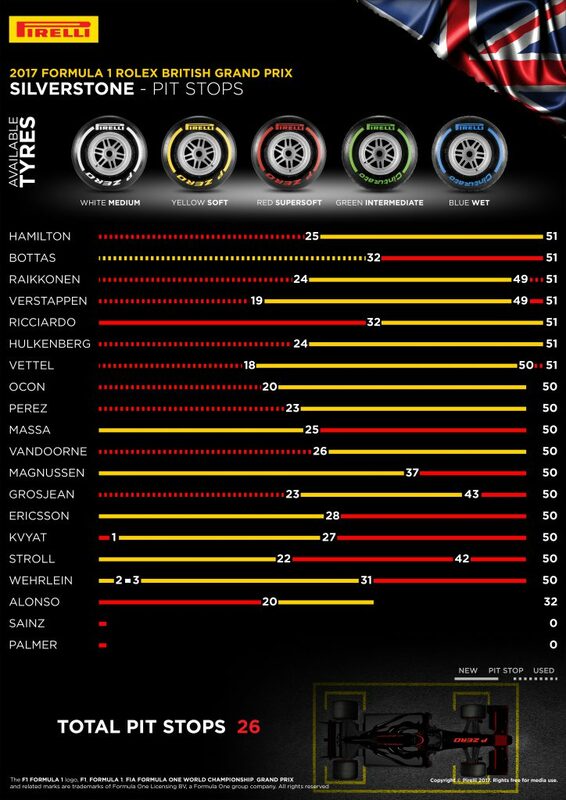 The SC basically gave him two free pitstops, but while tyre wear continues to be low, degradation was higher than recent races due to the demanding Silverstone circuit. This meant degradation wasn’t low enough to pull off this daring strategy and several other drivers (such as Wehrlein) had to go for a second stop late in the race.